Can you ever have enough vases? Personally I think not. If like me you’ve got a cupboard full of containers ranging from quality ceramics, to glass cubes you might be thinking twice about your next “must have” purchase. Inspired, by the search for a cereal box to make a pinhole camera for viewing the eclipse – which, unfortunately, once made was left unused as it was so overcast that the sun wasn’t shining! I’ve raided the recycling box for my next vase. By following these six simple steps and you’ll be able to make your own bespoke vase. 1. First of all I’d advise putting down a cloth to keep your surfaces glue free and wear an apron. Despite this being quite a small project, you can guarantee that at some point there will be a glue spillage. 2. 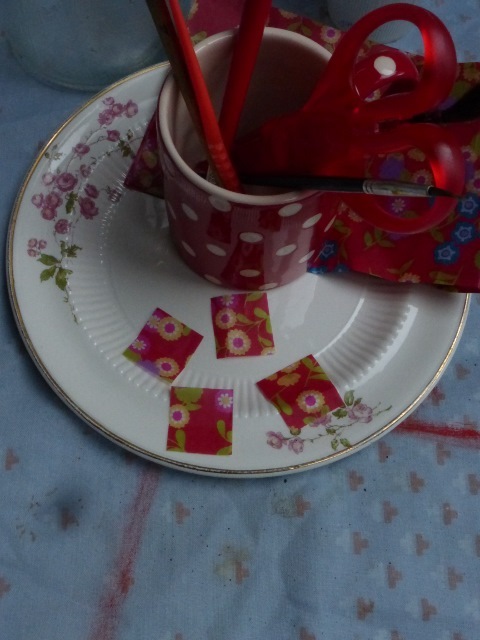 The next job is to cut up your decoupage paper. As my bottle is quite small, I’ve chosen a paper with a small print, which I think looks better than a very large pattern. If like me you go for a strong colour, I’d avoid a pattern with lots of white in it. I think it makes the finished piece look like its got holes in it, and hence a bit unfinished. I cut my paper into approximate squares of about 1.5cm. 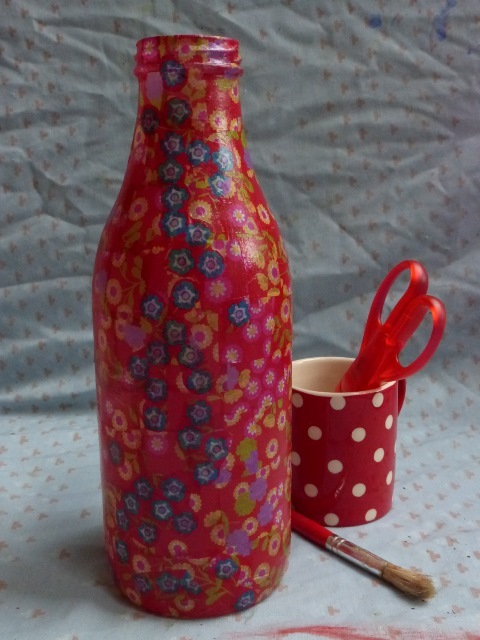 As I travelled up the vase, I cut smaller pieces so that I could better follow the tapering neck of the bottle. 3. Starting from the base, I put a light covering of glue on the bottle and positioned my squares so that they overlapped the base giving a really neat finish. I then worked around the base overlapping each piece. Once each complete ring was finished, I moved to the next layer and worked my way round again. As I completed each layer, I washed glue over the top surface of the water to give it a sealed/varnished effect. 4. A word of advice. When I hold my bottle up to the light (or put it on a window sill) I can see the patchwork of overlapping paper joints. 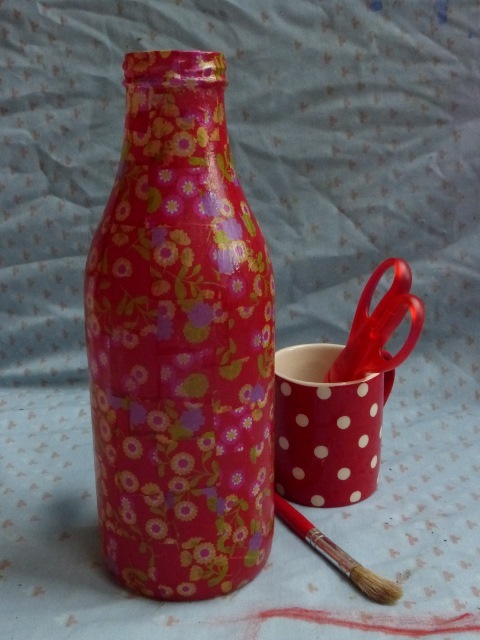 This might prompt you to be extra neat in your workmanship; sit back and embrace the home made arts and craft look; persuade you to paint the bottle first; or like me, display it against a wall where the light can’t shine through it. 5. 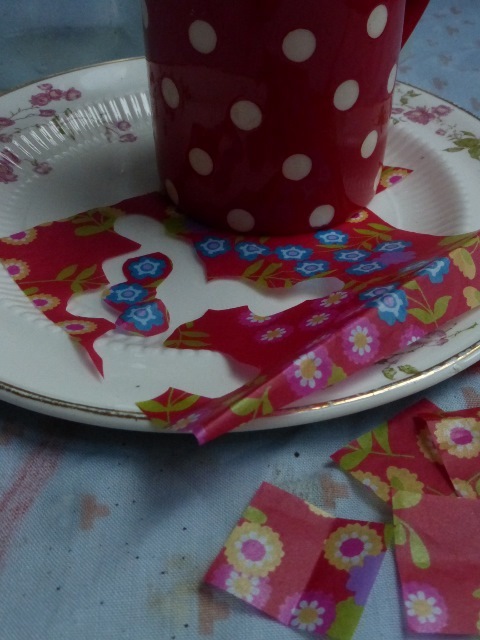 My decoupage paper had a blue flower print running through it, which I’d originally discarded. Once the vase was finished I decided to cut round the blue print and added it as a final flourish to one side of the vase. This gives two looks – a vase that is a splash of reds, oranges and pinks on one side and, on the other it has a Japanese-inspired line of pretty blue flowers. 6. 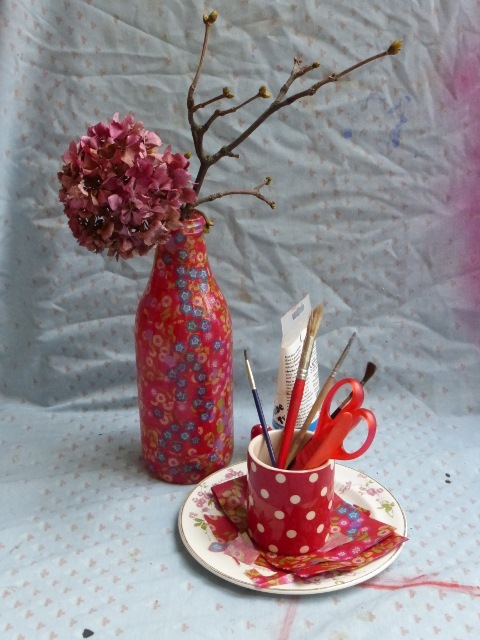 As my vase is heavily patterned, I’ve kept my flowers to a minimum. 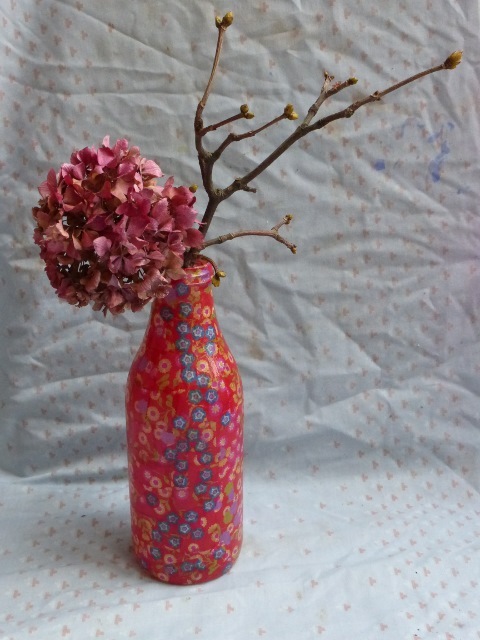 I added just a single dried hydrangea bloom and a budding branch. Why not have a go yourself. Don’t forget to let me know how you get on.